Y Touring, the driving force behind the wonderfully successful Beautiful Photography project is excited to announce the launch of a new partnership with the Centre for Digital Inclusion’s European branch, looking at developing mobile phones applications with young people that better the lives of the participants and their communities. Apps for Good is an exciting new course that is changing the lives of young people one app at a time! 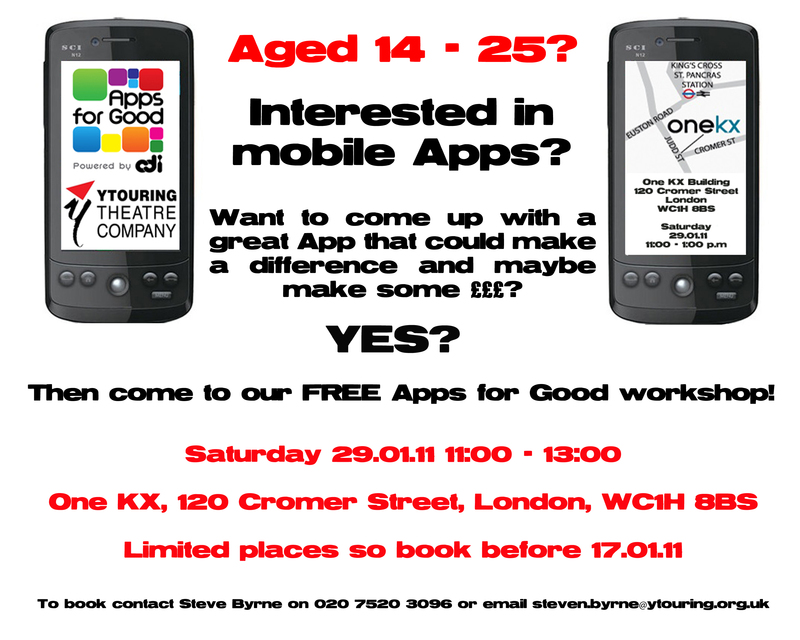 While a full Apps for Good course currently runs over 90-100 contact hours, this 90min workshop is a hands-on taster run by the Apps for Good team. The workshop will focus on the first out of five phases on the course: problem discovery. You will also learn about the functions of smartphones and about how to identify specific task-based problems that could potentially be solved with a mobile app. There are still places available, so for more information or to book a place please contact Steve Byrne on 020 7520 3095 or email steven.byrne@ytouring.org.uk. Today sees the launch of what some a hailing as a God send or should I say Gok send. Have you ever wanted your own personal stylist? I’m sure most of us would love the luxury but just can’t afford it. Well according to reports now we can! Stylist to the stars and TV fashion super star Gok Wan has worked with app designers Grapple Mobile to produce the Pocket Gok. A mobile app that works on any platform whether you have a iPhone, Black Berry or something different all together. For £1.79 you can have Gok in your pocket. Is it all a gimmick and a chance for some shameless branding? But, it does have some very good features. Once downloaded it give you the chance to enter your measurements, bust, waist and hip. Then it create a “body shape template” and provides you with handy little tips and style suggestions that are designed specifically to your body shape. Then the little “fashion fixer” will offer seasonal suggestions chosen specially by Gok himself. Each dress/outfit comes with helpful advice on accessories and an option to save the ones you like to a “My Shopping List” page so when your out shopping next you’ll know exactly where to go and for what. But it’s not all good with this app which is a shame. Fella’s you can forget this one as it’s strictly for the ladies! Come on Gok surely you should know that men like to look good too. Phones with low memory will run at a much slower pace because of all the images in the app. So you will have to ask yourself do you want a couple more dresses or a couple more tunes in your library. Also if you type in your measurements incorrectly at the beginning you can’t change them and you will have to do a total reinstall to reset the app. If you’ve already been out and got yourself a Pocket Gok let us know what you thought about it here in the comments section. Volunteer Kristy Noble was one of our last models of the day so it is only fitting that we end our string of interviews with her. In this clip find out just what she thinks about the Beautiful Project and listen to her adivce about body confidence. This what our young photographer Maisie King had to say about the project so far and her opinions on the issues of body image and body confidence. You may remember a while back I posted an email I received enquiring about the photo shoot day. The email talked about the struggles one of our volunteer models has been through regarding the way she felt about her body, it also spoke with a new-found hope and happiness she had discovered in herself. Well this is the author Kerry O’Brien and here is what she had to say about the Beautiful Project and body image. April-Rae lets us know what she thinks. In this clip April-Rae Hughes talks to us about her experiences as a young photographer on the Beautiful project. Here is another clip from one of our volunteer models. This time Kim Rogers is in the hot seat answering our questions.